On the occasions when I accompanied my dad to do a take away from the Malay food shops in Section 17 after school I always wondered whether this dish was a rendang that had been cooked until it was bone dry or was it simply a dish of fried chicken with lots of scraps from the bottom of the wok put and piled on top thus making it an accidental but delicious dish. I have wondered for more than 4 decades and have never encountered anyone who cooks this at home. I don' t think many know what its called. I could not do a google search because of that. But if you were to go to a Malay food shop you will surely see it. So I sometimes wonder if all this is just me ? Or is this all just me ? Then I found a photograph and the elusive recipe of this I-didn't-know-the-name dish on Jom Masak Jom Makan who got it from Ummi of Home Sweet Home. Finally. 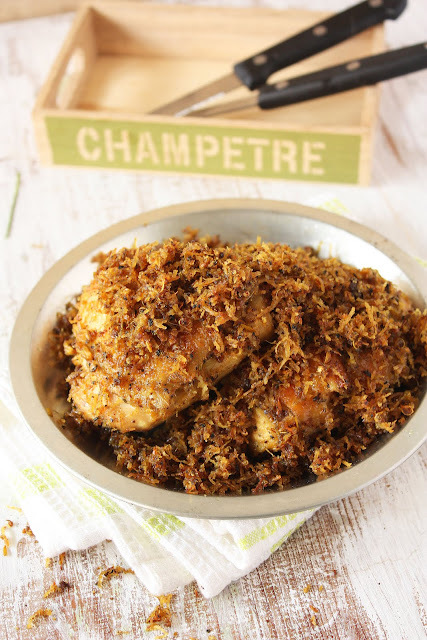 The name of this dish is Ayam Masak Kalasan Berseri. It's no wonder I was unable to locate this recipe. It's named after a place I have never heard of and I would never have guessed that this dish was named after a place. That I've never heard of. Phew. I'm feeling rather Nancy Drew-ish. It originates from an area called Kalasan in Yogjakarta in Indonesia. Apparently Kalasan is famous for its fried chicken fried in this special way. Thus it's name. The original recipe is here. It has a lot more ingredients, uses onions, garlic , chillies, coconut milk...etc.. ..very similar to a rendang recipe. But this shorter version adapted by Ummi is most delicious inspite of the omission of onions and other ingredients. This is the second time I am making this within a week. Yes it's good. I made a large amount using 6 whole chicken legs, bone in. You may halve the recipe. Dry roast the coriander seeds and pepper in a small pan until fragrant. Then grind in a processor or pound in a pestle and mortar until medium fine. Keep aside. Process the lemon grass, ginger and tumeric in a food processor until fine. Add some water if necessary to loosen it up. Then mix with the dry ground spices. Place the gound spices and wet paste into a large wok or pot. Add the grated coconut and water and mix top combine the mixture evenly. Add the chicken pieces and about a tablespoon of salt and a teaspoon of sugar. Cook over medium heat, stirring occasionally, covered until the chicken is cooked through or 3/4 way done. Turn off heat for a moment. It will be still be a wet pasty mixture. Take the chicken pieces out from the pot or wok shaking of excess moisture and the coconut/spice paste. This is where you are supposed to deep fry the chicken in oil. I did not. Instead, I placed the chicken pieces on a baking tray, brushed each piece with oil and then placed them under a broiler until they turned a golden brown. 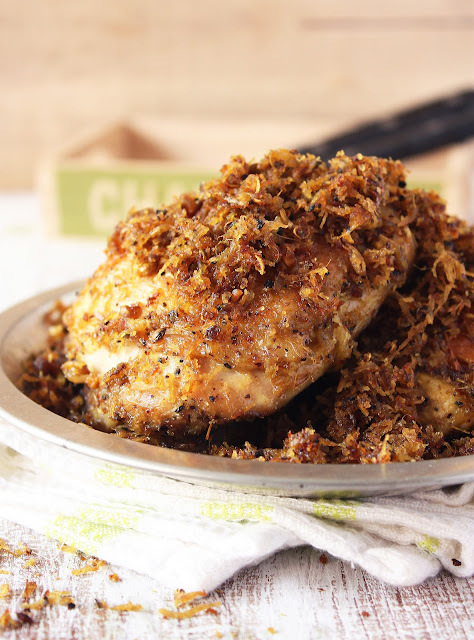 While the chicken is broiling in the oven continue to cook the coconut-spice mixture on the stove top until most of the moisture has evaporated then pour in the 1/2 cup of oil and continue to fry until the mixture becomes drier and golden brown. 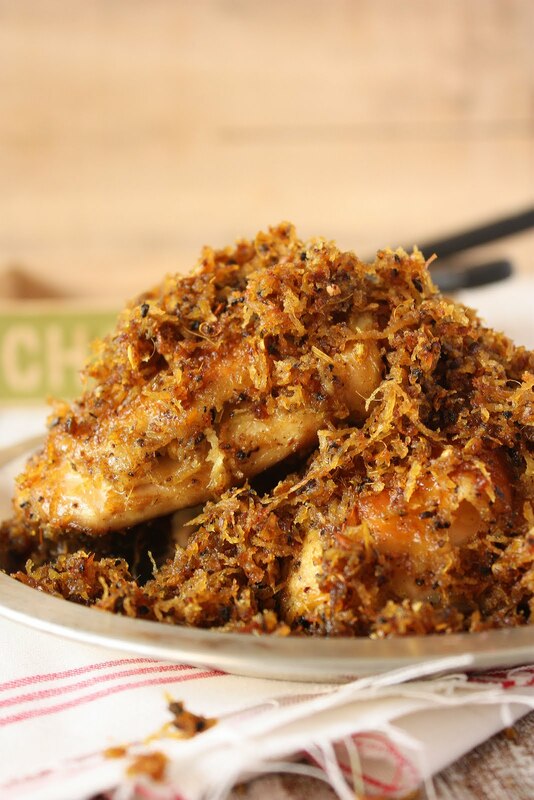 Note : Originally this coconut-spice mixture is also deep fried in the oil used to deep fry the chicken pieces. I thought that was too much deep frying for one's health. So I opted to simply add a 1/2 cup of oil and then dry-fry the mix until a golden brown. By which time the browned chicken pieces should be ready and thrown back into the coconut-spice mix in the wok. Stir the chicken pieces in with a spatula to coat the chicken pieces evenly and continue to dry fry a couple of minutes more until everything is evenly mixed and golden brown and dry. This is simply good served warm or at room temperature with steaming hot white rice eaten with the coconut sambal mixed into the hot rice and accompanied perhaps with a hot vegetable soup or curry. un super mega piatto, buonissimo!!! ti seguo anche su Facebook!!ciaoooooooooo! I so need to go food shopping ! Oliver was at a party today so it was take out for tea as he was far too tired by the time we were done. Oh my gosh! This looks incredible!! Ur method definitely is better than the original method. I won't want to deep fry the coconut. The oil will be wasted. This looks so good! My first thought when I saw it was 'serunding', haha. Zurin, this looks a bit like ayam penyet doesn't it, which also calls for a lot a deep frying, including the crunchy bits. Then there's Indonesian ayam goreng kremes as well. This will be so good for sahur this Ramadan! This looks amazing...I have to try it! Your photos are so good it looks like I can grab it off my computer screen!